Trulli can be found all across the Itria Valley. 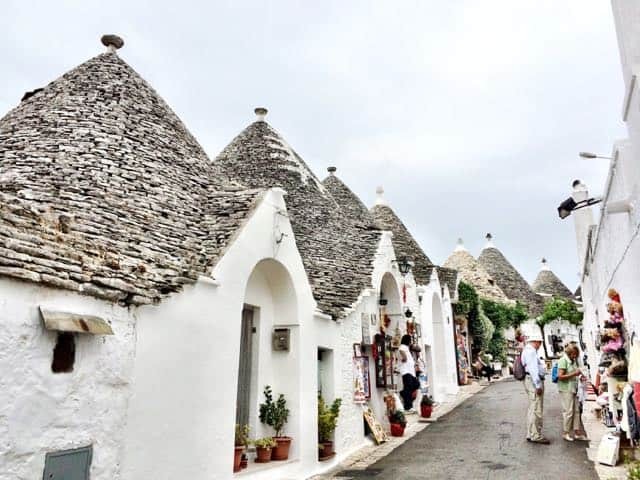 Alberobello is perhaps the most famous town in the Itria Valley due to its famous trulli houses. The conical rooftops coupled with charming cobblestone alleys and whitewashed houses are a simply magical sight. The old town, a UNESCO World Heritage Site, consists of a maze of streets and steps lined by trulli; drystone dwellings that were built using prehistoric techniques. The UNESCO World Heritage listed old centre of Alberobello. The famous trulli of Alberobello. Martina Franca is the largest town in the Itria Valley and can trace its roots back to the 10th century AD. Being in the heart of the valley, Martina Franca is a great base from which to explore the area but spend some time exploring its old centre which boasts beautiful baroque architecture (like the Palazzo Ducale and the impressive Basilica di San Martino) and quaint streets. When you’re here, drop by for dinner at Osteria del Coco Pazzo, a charming restaurant in a vaulted space that serves excellent Puglian food and wines. Ask for the local specialty ‘capocollo’, a cured pork salami. Locorotondo means ’round place’ and that’s what it is: a town in a circular form atop a hill. Its hilltop position means that you can see the town from miles around and once you’re up there, you’ll be treated to stunning views of the Itria Valley. View of the Itria Valley from Locorotondo. Can you spot the trulli? The town centre is a labyrinth of white alleys punctuated by churches or piazzas. The houses have pitched roofs called ‘cummerse’, a feature typical of Locorotondo. Walking around the historic centre is like a step back in time. Don’t forget to stop at a café and sip on a famous Locorotondo DOC white wine! Cisternino is often listed as one of the most beautiful towns in Italy. I beg to differ but this town, which dates back from medieval times, sure has a lot of charm to offer. It’s a delight to stroll around the picturesque lanes lined with the typical whitewashed houses and their external staircases. A quaint alley in Ostuni. 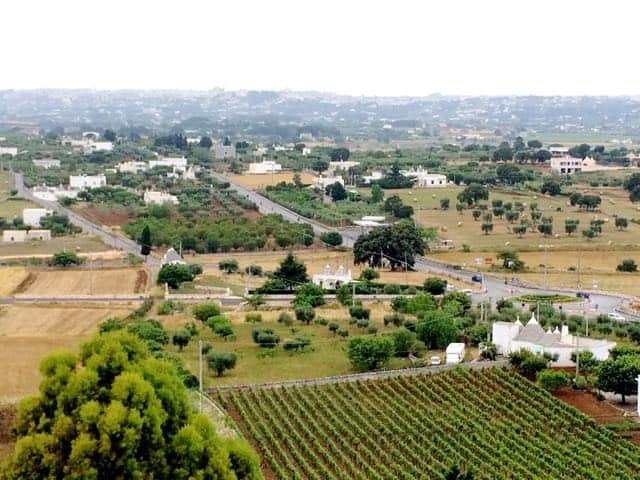 As you drive along the SS379 motorway that skirts the coast near Fasano, your attention will be drawn to the gleaming white appearance of Ostuni, also known as the ‘white city’. It’s an impressive sight that acts as a magnet for travellers. With its ancient cobblestone streets, grand churches and quaint white houses, Ostuni truly is stunning. The town boasts a remarkable history that goes back to the Stone Ages! The Cathedral and the Bishop’s Palace are especially striking but there are many other architectural gems to be found, including the old homes of the nobles. I’m cheating here as Polignano a Mare isn’t (technically) located in the Itria Valley. As its name suggests, it’s situated at the seaside but I’ve listed it here because it’s a town you shouldn’t miss and it’s only a short drive from the Itria Valley. Polignano a Mare can trace its origins back to the 4th century BC when Greek settlers founded the settlement of Neapolis. These days, the town is popular amongst tourists who come to visit its historic centre, perched precariously on the cliffs overlooking the Adriatic Sea, and enjoy its beaches. Make sure to make a reservation if you plan to eat at the town’s world-famous Grotta Palazzese, a spectacular cave restaurant. 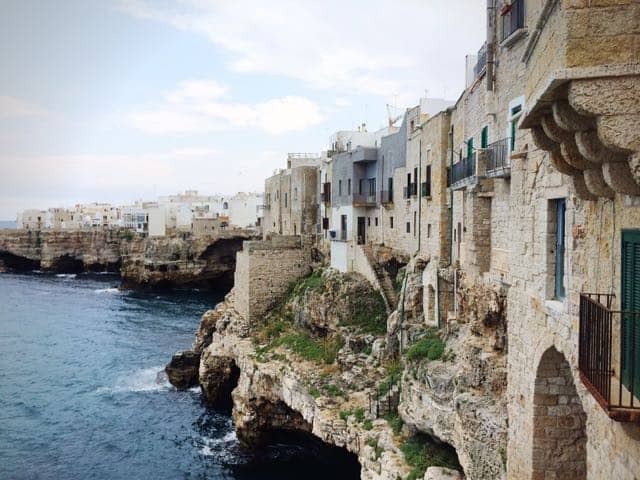 One bit of trivia: the writer of the famous Italian song, Volare, Domenico Modugno hails from Polignano a Mare. The spectacular Polignano a Mare. The Itria Valley is located in central Puglia between the region’s two gateway cities: Bari (read about things to see in Bari) and Brindisi. There are frequent flights from the major cities of Italy and other hubs in Europe to these cities. The Itria Valley is not more than a 1-2 hour drive from either Bari or Brindisi. Search for hotels in the Itria Valley. Check out my ultimate guide to Puglia. One more tip: if you’re exploring the Itria Valley, consider a side trip to Matera in the neighbouring region of Basilicata. It’s not more than a two-hour drive away. Matera is one of the oldest cities in the world and absolutely worth a visit. Read about things to do in Matera. So many white houses … Italy is truly a special place in Europe! ‘Same here. It was lovely to meet you. Are you guys going to TBEX too? In addition to the towns I mentioned in this post, I would suggest Lecce, Bari and Matera. If you have time, I highly recommend exploring the Gargano Peninsula in northern Puglia. Enjoy! All of these places look stunning, really good photos. I have to say that I am very interested in visiting all of these especially Locorotondo. Thanks for sharing this post. Love your pictures of all the places here-we are indeed coming to Puglia again this May. Suggestions for day trips? We are staying about 2-3 miles from Monopoli in a lovely looking casa/trullo. We will have a car-there is another couple with us this time and we want to make sure they love it as much as we did. This is why I love Italy. So many fascinating secrets at each and every corner! ‘Great Photos Keith! Dude, you killed it on the photos! I’ve actually never heard of that town. This is precisely the reason I enjoy reading travel blogs so much.